I listen to science, music, and news commentary podcasts on my bus rides to and from work (and often when I’m in my truck). I gave brief mention of my favorites in August with my “This podcast will blow your mind” Radiolab review of their “Limits” episode, but this entry has a detailed rundown of 10 more of my favorite channels. As the above iTunes screenshot illustrates, I star-rate my favorites and often “Love” them on Last.fm, as well. While my iPod automatically cleans off old podcasts, if I add a podcast to a playlist it won’t get removed and I can later remember to give bands a second listen. 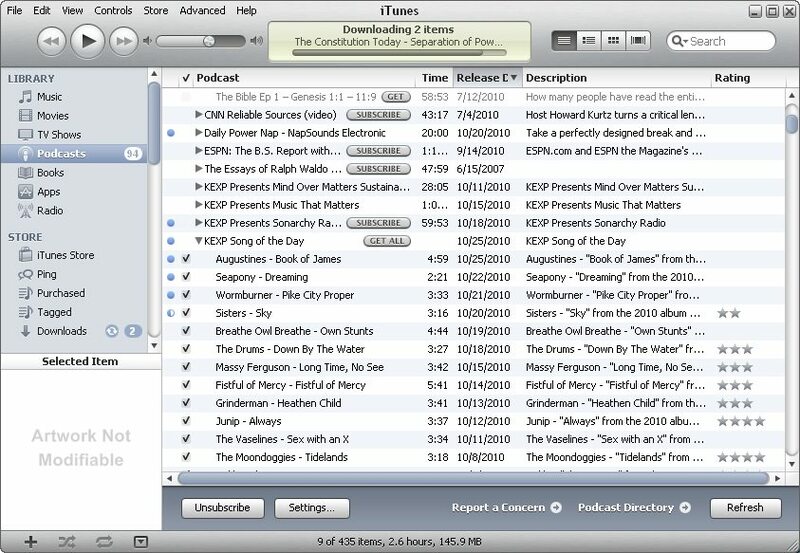 I generally don’t like the iTunes podcast interface, though, and the latest episodes often fail to upload. 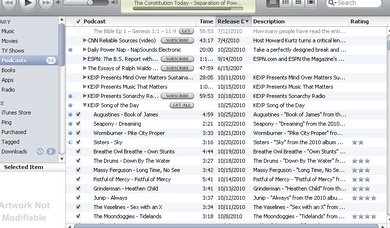 I have a few others podcasts I listen to occasionally, but these are my dailies. All free, of course, and available on iTunes. I try out new ones from time to time, so feel free to ask my opinion on others that you’ve heard about. I listen to Fresh Air in the car sometimes, so I should probably download that, too. My latest search is for a Creative Commons/public domain music podcast if anyone knows of any (it’s nice to have background music to include in homemade videos or audio pieces that I work on once in a blue moon). Click on the “feed” links to listen to samples on the RSS pages. This American Life (feed) – 1hr, weekly, hosted by Ira Glass and one of the most popular podcasts in the world. Uniquely-crafted special topics. They had a TV version that aired for two seasons, but I’m not sure if you can get those free online or not; I’ve watched one of them and it was okay. Radiolab (feed) – 1hr, once or twice a month from Jad and Robert; they also do 20min shorts occasionally. Very similar to TAL, but I find these even better. Limits and Words are two recent favs. Probably my fav podcast, but they’re in need of funding! The Diane Rehm Show from WAMU and NPR (feed) – 50min daily (closer to 40 if you skip the breaks); also does a Friday 2-hour news roundup, although I rarely have time to listen to that. News topics & guests, author interviews, listener call-ins. On Point with Tom Ashbrook from WBUR and NPR (feed) – 45min daily. Between him and Rehm (they’re both the same format), there’s something fascinating to listen to daily. The Sound of Young America (feed) – 3 to 40min (yes, very random) every other day. Jesse Thorn interviews famous young people (usually younger than 40). Stuff You Should Know (feed) – Anywhere from 20 to 50 minutes, weekly. Chuck and Josh discuss random fascinating topics like biospeleology, cremation, and mirrors. Savage Love (feed) – 50min every Tuesday, call-in relationship advice show from a gay guy. NPR Music Reviews (feed) – 7-8 minute new album reviews every couple of days. The Album Project (feed) – Weekly alt rock podcast of four or five songs from bands you’ve probably never heard before. KEXP 90.3 FM Podcasts: Song of the Day (feed) – Similar to Album Project. I find about one great song a week. KEXP is a Seattle alternative station. KEXP Music That Matters (feed) – 1hr, every other week. KEXP DJs play indie artist mixes. If it wasn’t for The Best New Electronic Music podcast on NPR, I wouldn’t have noticed Gold Panda (a band that meticulously mixes their music to produce beautiful dance instrumentals) as soon as I did. This Snow And Taxis video can be downloaded as a free mp3 on their website.